Now then, what do you think of this? 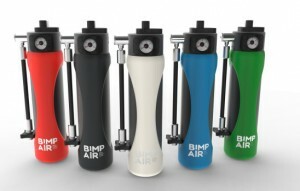 Bimp’ Air is the latest product we’ve spotted from the crowndfunding circus and it’s a compressed air canister that can be fitted to your frame and recharges as you ride. So what’s it used for? Well pretty much anything on your bike that needs air! It can apparently fully inflate a tyre in less than ten seconds, which would certainly be useful if you’re stuck with a flat in the middle of nowhere. The most nifty feature of the Bimp’ Air is that it can refill as you ride thanks to a compressor that attaches to your front hub. Apparently this will be able to fill the canister after just 11 minutes of riding, although we don’t know how much this system will weigh so we couldn’t comment on how it would affect your handling just yet. Alternatively you can fill the canister with a compressor that uses your car’s 12 volt socket. While this does seem like it could be useful, there are a couple of sticking points we’ve noticed. Firstly the canister can only inflate a 29×2.0″ tyre to a maximum of 31 psi, so someone with a bigger volume tyre may struggle to gain enough pressure. Secondly is the price. There’s no easy way to put this but Bimp’Air is asking for $335 (£240) for the canister and on-bike compressor or $445 (£315) for a canister and in-car compressor. Whenever we post something like this we always read comments that say “it’s a solution to an invented problem” and in this instance we have to agree. We can’t see racers using this as carbon dioxide capsules are a better (if less eco friendly) solution and for an every-day rider it takes up too much valuable room on your bike. However if you disagree with us then the Bimp’ Air is currently seeking crowdfunding on IndieGoGo and you can support it here. What do you think though? Let us know in the comments below?